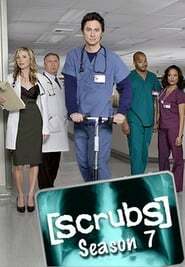 The seventh season of the American comedy-drama television series Scrubs premiered on NBC on October 25, 2007 and concluded on May 8, 2008 and consists of 11 episodes. This was the final season to air on NBC after it was picked up by ABC. Season 7 was confirmed to have a reduced number of 18 episodes and was likely to be the final season. Due to the 2007–2008 Writers Guild of America strike, only 11 episodes were finished and 6 aired before the strike. During the strike, it was unknown if production on the final episodes would resume or that a possible series finale would air due to the actors’ contracts expiring if the strike were to last a long time. After the strike was over, the final five episodes aired starting April 10, 2008. Episode 12, titled “My Commitment” was partially completed before the strike, but was never completed or aired. Some material shot for “My Commitment” was later used in the season 8 episode, “My Nah Nah Nah”.